Abe’s calls for dialogue belie the real direction of Japan’s foreign policy. Japan’s 2014 Ministry of Defense white paper was released on Tuesday, and regional territorial disputes figured heavily in the 505-page report. While North Korea was mentioned, most of the report’s findings focused on China and its growing military presence in the East and South China Seas. The overt focus on China could have an interesting effect on Japanese foreign and military policy, as the Cabinet of Prime Minister Shinzo Abe adopted the report on the same day. Abe has recently been pushing through multiple channels to meet with Chinese President Xi Jinping, claiming that “his door is always open” to mend ties with the Chinese president. However, the Cabinet’s adoption of a normalized view on collective self-defense in late June makes this latest white paper more ominous than previous iterations. This is exactly the type of language that Japan and the U.S. used when confronting China at the Shangri-La Dialogue hosted by Singapore in May, after which Japanese/Sino relations reached another low point. The difference now is that the Abe government is well on its way to enshrining its new self-defense capabilities through proposed legislation in the Diet and by having the right included in the update to the Japanese-U.S. defense cooperation guidelines scheduled for the end of this year. It is difficult to reconcile the government’s increasingly hawkish behavior with Abe’s direct requests to meet with Xi later this year at the APEC summit in Beijing this November. Abe said at a press conference on Saturday that “If issues of concern exist, then dialogue should be held” and that the two countries should return to a “mutually beneficial relationship based on common strategic interests.” It would appear that for now Abe is still much more interested pursuing a stronger defense posture relative to China than seeking a path of mutual benefit. As his actions on collective self-defense are likely much more indicative of his true position on China, his pursuit of dialogue can be seen almost as an insurance policy. 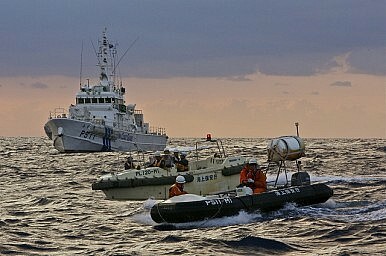 As Japan ratchets up its military capabilities and singles out China as the region’s premier threat, Abe will be able to point to several public and private attempts at dialogue with China that went unanswered, attempting to be the voice of reason should territorial disputes again take a turn for the worse. Surprise: Japan Sees China as Its Main National Security Threat Abe Heads to G-7 with South China Sea, Asian Security on his MindThe Japan-China Defense Hotline’s Growing ImportanceAbe’s Attempt to Corner China Through DiplomacyIs This a True Thaw in Sino-Japanese Relations?